One thing that surprised me was the number of runs the Mets allowed – six! The Mets have allowed 6 or more runs in 33 games, and six of them have been in August. In those six games, though, the Mets are 4-2. Does that sort of game really come out in the wash? I decided to crunch some numbers using the Baseball Reference Play Index and find out, with the hypothesis that the number of high-scoring games for opponents doesn’t really have an effect on the team’s overall record. 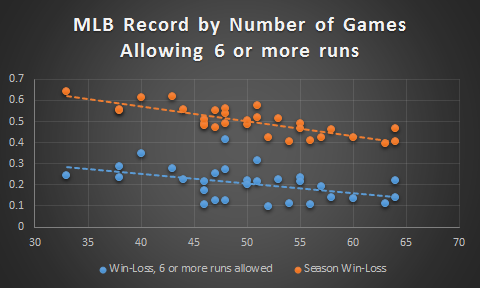 For the record, the correlation between 6-runs-allowed games and win percentage in those games is -.457, meaning that there’s a noticeable negative effect on performance in those games; however, the correlation between the number of those games and season win percentage is even stronger, at -.805. One way to interpret those numbers is to say that a team can recover in an individual high-scoring game, but a team that consistently allows such high scores will eventually see the losses add up.